Here is the first part of a small selection of works from TEFAF that caught my eye. 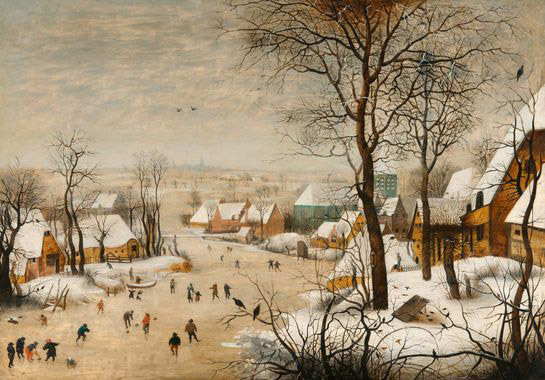 Pieter Brueghel the Younger made several copies of his father Pieter Brueghel the Elder`s popular masterpiece Winter Landscape with Skaters and Bird Trap of 1565. Brueghel the Elder and his descendants were pioneers of the Netherlandish genre painting with bucolic scenes depicting the customs and traditions of village life. It was very rewarding to see this beautiful grey landscape in Maastricht and the genuine painting in the Royal Museums of Fine Arts in Brussels the following day. This painting sold at auction in Agguttes, Paris – Drouot in December 2012 for 242,250 €, well above its high 160,000 € estimate. One year and three months later it is again on the market. Hans Bol was one of the many skilled artists that emigrated from the Southern Netherlands (modern Belgium) to the Northern Netherlands (Holland) due to the war with Spain and the religious unrest. He was specialized in Waterschilderen, a technique for painting large-scale watercolor or tempera onto canvas, drawings and miniatures. In fact, this oil on canvas is very rare within the artist`s oeuvre (in the aforementioned auction the painting was attributed to Bol, that is to say, it is probably by Bol but not absolutely certain). In Los Angeles County Museum of Art, there is another landscape by Hans Bol but painted in a combination of tempera and oil on canvas. 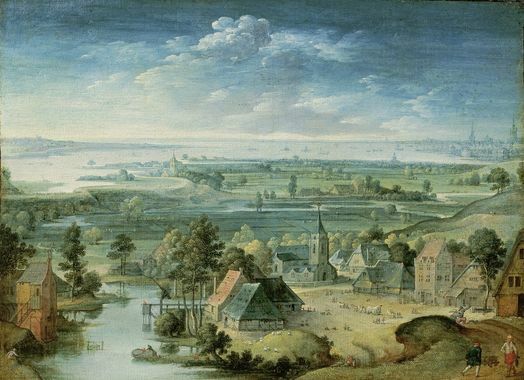 Be that as it may, when I saw this painting I loved its beautiful deep view with the river Scheldt on the horizon and the delicate sixteen-century Flemish blue atmosphere that reminds me of the exquisite Joachim Patinir`s landscapes. 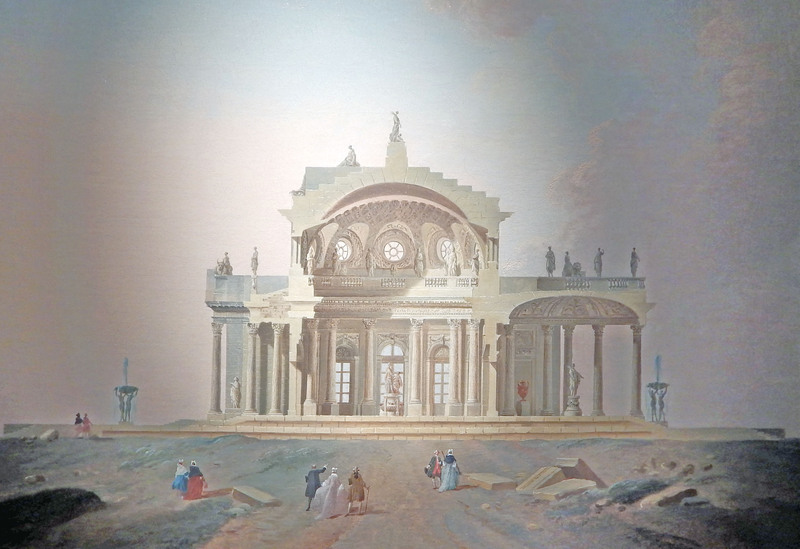 I love this magical painting that combines a technical cross-section of a classical villa and the fantastical romanticism of the surrounding ruins. Its soft colours contribute to the ethereal and theatrical quality of the scene. The painting is one of a pair of depictions of the same villa. Its companion is a distant profile with a slightly higher viewpoint. The pair last appeared at auction in Sotheby`s New York in 2011 with an estimate of $100,000 – 150,000. I was absolutely amazed when I saw the group of free-standing portable folding screens presented by this London-based gallery, specialized in antique Japanese paper screens (byobu). Some of them were arranged as paintings, hanging on the walls. 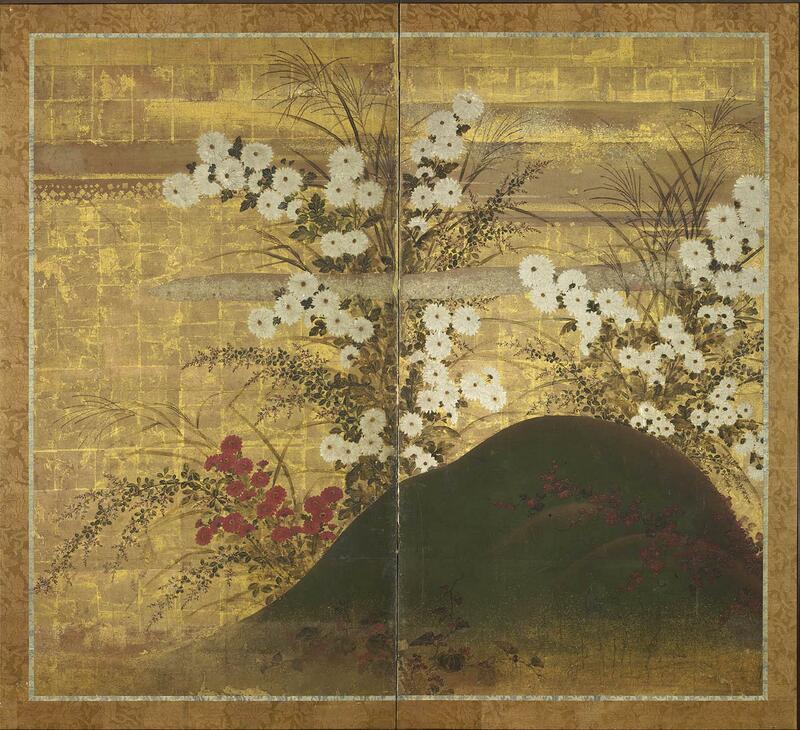 I have found some information about those intriguing and exquisite objects in the catalogue of the exhibition Momoyama – Japanese Art in the Age of Grandeur at the Metropolitan Museum of Art (1975). They were, together with the sliding doors (fusuma), a ‘type of traditional room partition that provided a surface for paintings. These were usually designed in pairs, each half having six, or sometimes two or eight panels’. They consisted of a ‘simple latticework frame of Cryptomeria wood (Japanese cedar) over which the mounter applies seven separate layers, each consisting of many small overlapping sheets of paper made from the bark of a flowering plant called paper mulberry. On alternate layers the sheets are pasted down only around their edges, rather than across their entire faces, leaving air pockets that increase the strength and durability of the screen. The outermost layer on both sides serves as the painting surface’. Lastly, the different panels are connected by paper hinges (which allow folding in both directions) and the screen is trimmed with an embroidered silk brocade frame. The example above is painted in ink and colour on gold leaf. Absolutely stunning!